Wouldn’t it be good if someone could point their smart-phone, or tablet, at one of your labels and immediately see the related SDS on their mobile device? With the new QR Code feature on our GHS labelling software, you can do just that. Label Enterprise is our ideal solution for producing high quality hazard warning labels. It fully supports GHS/CLP formats and is designed to work with any standard Windows compatible printer. 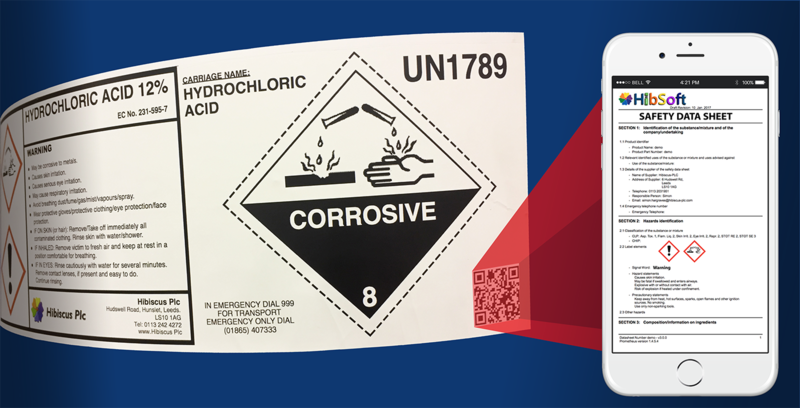 Enterprise quickly and easily produces labels for carriage, supply, janitorial and many other functions, and when used in conjunction with our QR feature it will enable you to create a direct link from your hazard labels to your Safety Data Sheets. A QR Code (Quick Response Code) is a type of two-dimensional barcode that can be read by smartphones and tablets. The codes can link directly to text, websites, phone numbers, email addresses, social media and much more. QR Codes are different to standard vertical reading barcodes in that the data is stored in both directions which means that they can be scanned vertically OR horizontally. You can quickly and easily create your own QR codes with a free QR Code Generator. If your SDS’s are available online, then just by adding the appropriate web-link as a QR code on your label, your customers (or anyone else coming into contact with your labels) could immediately have access to many types of valuabe information that’s NOT printed on the label. All of this information, and other dynamic content, can be added to your labels through our QR Code module. Book a Free Demonstration today and let us show you how our software can benefit your business.